Preparing for fall race season isn't just about building up strength and mileage. It's about quality mileage. At least once a week, start reintroducing faster paced runs into your routine with interval training and tempo runs at half marathon effort. Why? By easing structured speed back into your routine before official training begins, you prepare the mind and body for the harder, faster, higher intensity speed and stamina workouts in the months ahead. As a result, you'll be ready to dive head first into training rather than spending the first half re-conditioning your body, reawakening the fast twitch muscles and building up your stamina to handle tempo runs at your target pace. 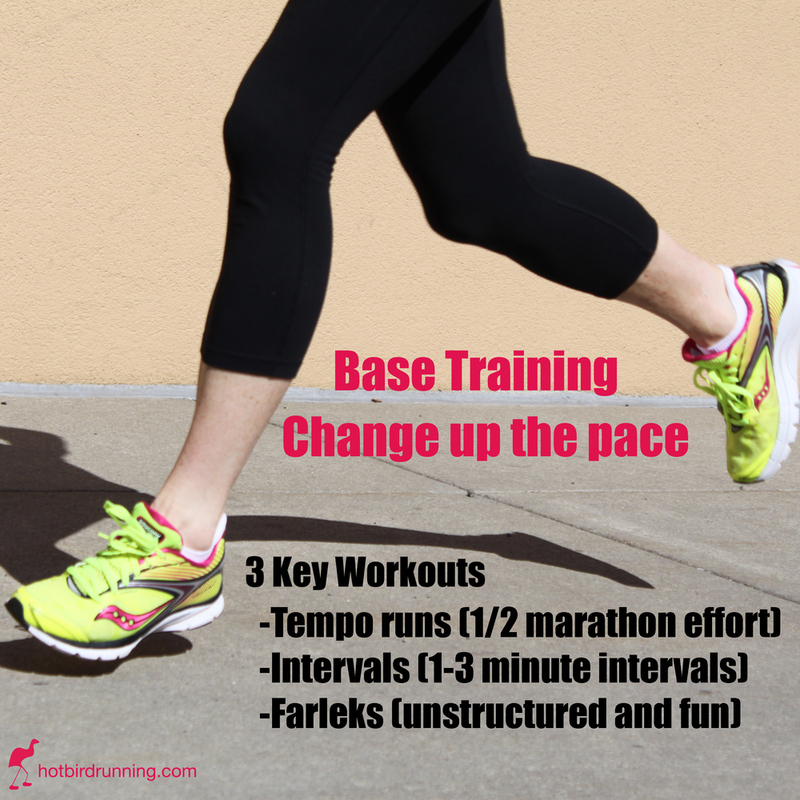 Tempo Runs: After a mile warm up, pick up the pace to a comfortably hard effort for 15-20 minutes. What's a comfortably hard effort? We like to think of it as one that's difficult to carry on a conversation, but not impossible to respond to questions with one word answers. Implement these once a week or every other week. Intervals: After a mile warm up, alternate between 1 to 3 minutes of faster paced runnning and an equal amount of slow, recovery time. Continue your intervals for 15 minutes total in the beginning and build up to 30-40 minutes of intervals (total time includes both your speed and recovery intervals). If you know your half marathon pace, then aim for this pace during your faster intervals. If not, then aim for a similar pace to the tempo runs. Implement these every 2 or 3 weeks. Fartleks: After at least a mile warm up, incorporate spontaneous bursts of faster paced running into a regular run - either up hills or on the flats. The duration and pace of your faster bursts can be random and undefined. The purpose is to reintroduce faster feet and start recruiting the fast-twitch muscle fibers with bouts of faster paced running without having too much structure in your running. Avoid all out sprints, aim for fun and use what's around you (mailboxes, lamp posts). Incorporate these runs every 2-3 weeks.